1. Heat gas or charcoal grill. If using bamboo skewers, soak in water 10 minutes; drain. In small bowl, mix vinegar and honey. Beat in olive oil in thin stream; set aside. 2. In medium bowl, mix wine, melted butter, garlic and salt. Add mushrooms and onion wedges; toss to coat. 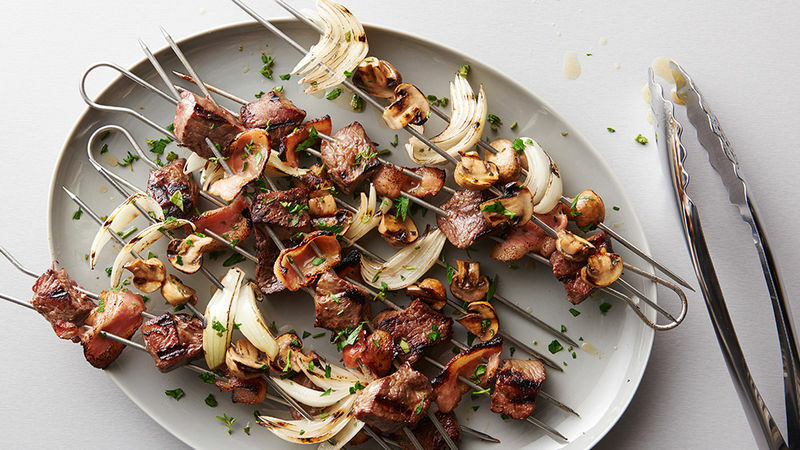 On each of 4 skewers, alternately thread mushrooms and onion. Add beef to wine mixture; toss to coat. On remaining 4 skewers, alternately thread beef and bacon, leaving space between each piece, starting and ending with beef. Discard any remaining wine mixture. 3. Place kabobs on grill over medium heat. Cover grill; cook 5 minutes. Carefully brush skewers with vinaigrette; turn, and brush other sides with vinaigrette. Cook 5 to 10 minutes longer or until vegetables are tender and beef is cooked to desired doneness (160°F for medium). Sprinkle with parsley, thyme and sage.